Experience the beating pulse of one of the most diverse major cities in the heart of south-western Germany. Mannheim represents economic strength, vitality and inspiration in the center of the Rhine-Neckar metropolitan region - only 30 minutes by train from Frankfurt airport. With about 325,000 residents, the city scores with metropolitan qualities without the anonymity of big cities. Mannheim is the host city of top international sporting events and the chosen location of global industrial and service companies. The city has proudly held the title of UNESCO City of Music since 2014 and is a cultural center and region of delights and the good life. Download our Guide to Mannheim - a useful document with travel tips, things to do once you arrive, and much, much more! 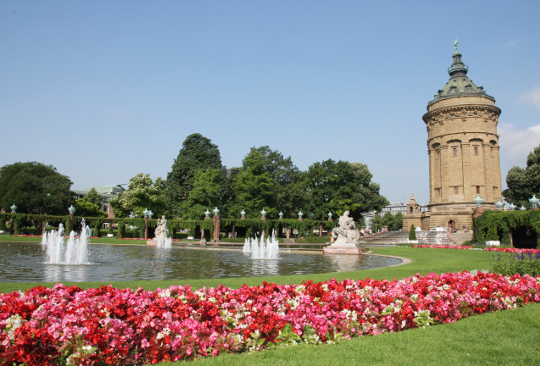 Mannheim offers plenty of choices of activities: theaters, operas, galleries, parks, restaurants or beer gardens. Mannheim's tourism office suggests activities for all tastes and displays information about attractions and events. Within the city as well as the region, you reach everything easily via bus, tram, city train or train. This is a result of the area-wide network provided by the transport association Rhine-Neckar (Verkehrsverbund Rhine-Neckar – VRN). For a map of the main transportation network in Mannheim, click here. A single ticket costs EUR 2.50 and can be used for one journey for 90 minutes. You may change to different lines and means of transportation and also interrupt your journey. The modern VRN ticket machines are the simplest and quickest way to get your ticket. Please validate your ticket in the tram by putting the ticket inside the validation machine. You can also download a free app to purchase tickets to your smartphone. Detailed information on lines, timetables, and fares for public transportation can be found here.